There are so many facts about sea otters that you barely find some of them to be true; the cutest thing about these sea creatures is that they hold hands while sleeping. This is something that a lot of wildlife photographers have captured and hence, it became a fuss in the media. 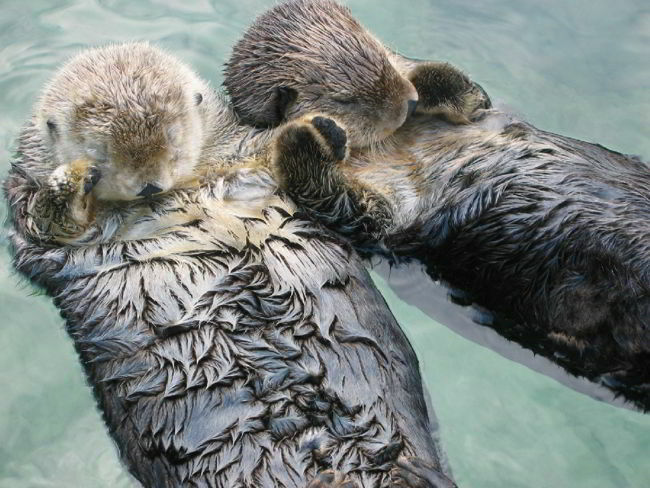 The reason why sea otters hold hands while sleeping is so that they don’t drift away from each other when they are in deep sleep. It may sound to be cute to you, but the reason also proves their intelligence. The photos of sea otters holding hands have been downloaded several times by millions of people; the truth is that they are not mere photos, but a fact that has proven to be true. You won’t see all the sea otters holding hands of each other; it is usually the mother holding the hands of her pups so that they don’t leave her side or drift apart when she is sleeping. It is not quite possible for this creature to stay up and keep an eye on her pup; hence, the solution. It is quite easy for the otter-pups to drift away in the sea, for they sleep right on its surface. However, when the mother holds their hands, they don’t slip away and that’s how she keeps them all close to herself. No matter how many pups the mother has, she ensures that she has a tight grip on all of them so that they don’t go off her sight and touch. The most amazing thing about these sea creatures is that this is not the only fact that surprises people; there are many that keep the readers in love with them.